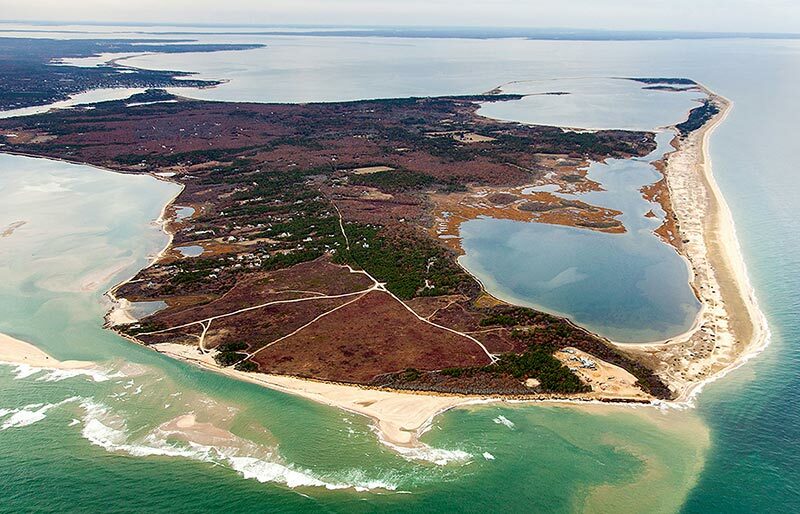 A recommended bid from Grain Communications Group would have a tower on Chappaquiddick Island in 180 days or less. Edgartown selectmen are scheduled to discuss a bid from Grain Communications Group to build a wireless communications tower on Chappaquiddick. The company is proposing to build a 150- to 180-foot monopole, possibly disguised as a flag pole, on one of three town-owned parcels of land. Poor cell phone reception has been a longstanding point of discussion in the Island’s easternmost community. At one point, there was discussion of constructing a distributed antenna system (DAS), which relies on small antennas set on utility poles. However, wireless companies showed no interest. Last October, in another effort to improve wireless service, Edgartown issued a request for proposals (RFP) to bring wireless reception to the island. At a meeting of selectmen on May 26, Adam Darack, town information technology (IT) manager and Juliet Mulinare, chief procurement officer, recommended the Grain bid. Mr. Darack explained that six companies requested more information in response to the RFP. Three companies submitted bids prior to an April 7 deadline. The other two bids were from Homeland Security Wireless and American Tower Corp. He said all three bidders proposed building towers. Once a tower is built, the company would then solicit wireless carriers, for example Verizon and AT&T, to lease antenna space. The company’s initiative stood out to Mr. Darack in the bid-selection process. “Any cell-coverage solution will face a substantially cumbersome political and public process, and a vendor who has shown an unsolicited willingness to physically be here during this preliminary stage displays how their commitment will be throughout the process,” Mr. Darack said. Though the recommendation was received favorably by selectmen, a contract is still down the road. “All we have done to this point is select a bid that would allow a vendor to start the public process of hearings, permitting, etc., if we come to terms with an acceptable contractual agreement,” Mr. Darack said. “Now it’s in the public’s hands,” Mr. Darack told selectmen. Mr. Darack is aware that a tower’s appearance is concerning for Chappaquiddick residents. “[The company] is aware that the height, look, et cetera, are all issues that will need to be determined as part of the public process,” Mr. Darack told The Times. Roger Becker, Chappaquiddick Island Association president and a former member of the disbanded wireless committee, said he and many residents are concerned that a tower would be obtrusive, interrupting the skyline on a part of the Vineyard valued by many residents and visitors for its remoteness. Mr. Becker has been working hard to generate opposition, and called on Chappy residents to turn out in force on Monday. Grain Communications Group has several ties to the Island. It is the same company that built the 120-foot-tall cell tower at the Martha’s Vineyard Arena in Oak Bluffs. Further, David Grain, managing partner and founder, owns property in Chilmark. Mr. Grain is on the board of directors of the Sheriff’s Meadow Foundation, and is one of the top donors to the Martha’s Vineyard Theater Foundation. As of now, no tangible design plans have been submitted, though the bid proposes constructing a 150- to 180-foot monopole behind a chainlink fence. “We won’t have antennas or spec sheets until there is a customer. Each customer will determine their own antenna and antenna enclosure requirements,” the bid reads. Grain Communications Group has proposed a 28-week-long project. “It is Grain’s intention to have a site ready for use by residents, visitors, and workers of Chappaquiddick 180 days from the date that we have an approved contract with the Town of Edgartown,” the bid stated. The town’s RFP requires that the tower design be submitted within 30 days of contract execution. Grain Communications Group has succeeded in attracting providers to the Island in the past. The bid on the table says that both AT&T and Verizon have already committed to the Oak Bluffs tower. Sprint and T-Mobile are expected to follow suit, the company said. In June 2012, selectmen accepted what was the only response to the original RFP. It too was submitted by Grain Communications Group, in conjunction with Broadband Service Group, a Michigan-based company. Developers, however, were unable to attract any mobile carriers to sign up for the proposed DAS network. “It wasn’t financially feasible, and it didn’t go anywhere,” Mr. Darack said of the original proposal at the May 26 selectmen’s meeting. Last summer, at an August 11 selectmen’s meeting, discussion focused on the limited nature of the previous RFP, which only solicited for a DAS. Selectmen agreed to expand the RFP because of overwhelming support at that meeting. Hence, the RFP issued in October allowed for other technology, i.e. towers, to be proposed. Others at the August meeting highlighted safety concerns associated with being unable to reach emergency personnel. Chris Kennedy, the Martha’s Vineyard superintendent for The Trustees of Reservations, remained bipartisan, but said there is no reliable cell phone signal on the beaches from Wasque to Cape Poge, and calls are routinely dropped or garbled, which could cost valuable minutes in an emergency. In September 2014, Edgartown selectmen voted to approve a lease to AT&T, which would place a wireless phone antenna inside an empty silo on the town-owned Katama Farm. It was intended to improve cell reception in the Katama area. Georgiana Greenough, planning board assistant, announced at the May 26 selectmen’s meeting that AT&T had halted the project. Ms. Greenough said that AT&T had not said why the project was on hold, and that she was having difficulty getting hold of people at the phone company. “They’re not honoring their contract,” said Pam Dolby, town administrator. “They can’t just sit on that. It’s not fair to the residents of Katama,” she added. AT&T has paid the $28,000 for the first year of their lease, Ms. Dolby told selectmen. Before the contract was signed, the company and the town had negotiated for several months over legal language, and selectmen had expressed frustration at the slow pace of negotiation. “So by spring, without fail, they’ll be up and running?” Chairman Michael Donaroma asked following the vote on the lease in 2014. The contract calls for AT&T Mobility to pay the town $28,000 the first year. Payments will then increase 3 percent each year. Edgartown is supposed to accrue $321,000 over the course of the 10-year contract.